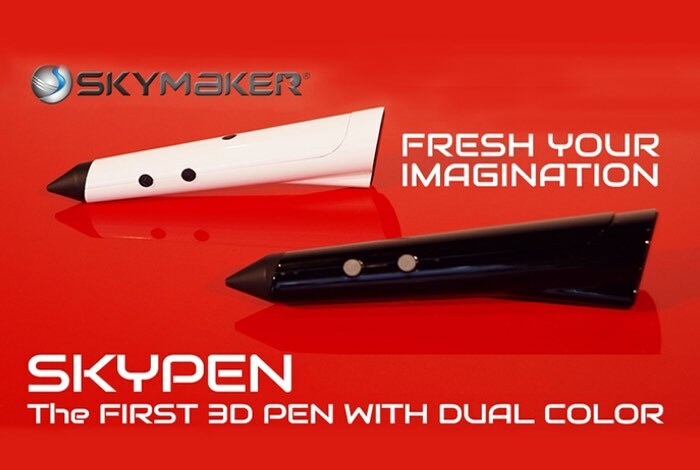 Over the last 12 months 3D printing pens have become in popular creative device and now Sky Tech have introduced the first dual colour 3D printing pen. Not only is the SKYPEN offering dual colour 3D printing it is also priced at just $19 and available to back over on the Kickstarter crowdfunding website, with the aim of raising $50,000 over the next 27 days. Additionally, we are not confined to a single color. With SKYPEN DUAL, we can own two colors at the same time in the pen. It is easy to switch colors by pressing the buttons on the pen. In addition, users can make filament come out from the pen nib continually by pressing the input button for 3 seconds. On the other hand, press the output button for 3 seconds and filament will come out continually from the hole on the top of SKYPEN DUAL. It is well established for its simple operation and powerful functions in order to let users use the pen more effectively. It is different from ordinary 3D pens. For more information on the new SKYPEN jump over to the Kickstarter website for details and to make a pledge.